The South Australian Footballers' Companion published at the end of the 1877 season began with the comment: "it may indeed be chronicled in the annuals of South Australia that in the year 1877 football first took its place as a popular sport in the colonythe formation of an association towards the end of Aprilgave football an impetus such as it had never before." Interestingly, the meeting at which the Association was formed took place a fortnight before a similar Association (the VFA) was formed across the border. At the same meeting, when rules were being decided on, it was the South delegate, C.C. Kingston, who insisted that the ball used should be oval in shape, and not round, and that players should have to bounce the ball and not run with it as in rugby. 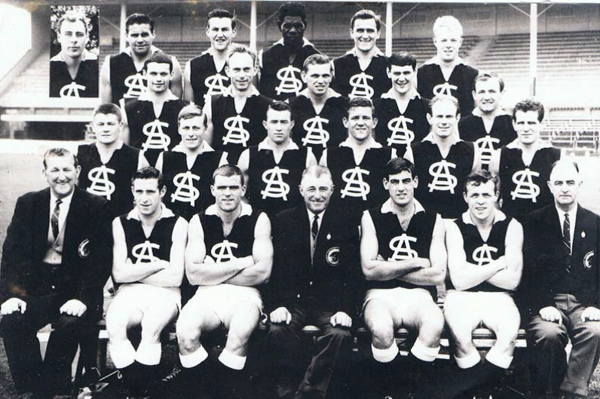 With the idea of a Finals round still a couple of decades away, and with the eight teams that took part playing a different number of matches, it was the South Adelaide team, ably captained by George Kennedy, that was declared by consensus to be the best performed team in this first year of competition. 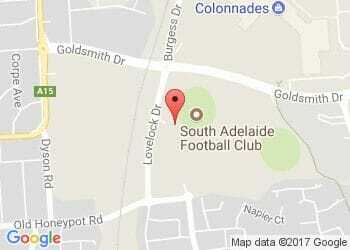 At the annual general meeting of the South Adelaide Football Club in March 1885, the president, C.C. Kingston, drew attention to what he considered to be the lack of training at the club over the previous years; to help counter this, he offered a gold medal to the man who trained most carefully, and another for the player that was considered the best and most unselfish at the end of the season. Such inducements must have worked in that year's four team competition, because South Adelaide, which had been equal second with Norwood in the previous year, finished on top at the end of the year with 11 wins and two draws from the 15 games played, with Ports in second place with just seven wins. In his review of the season, Goalpost, writing in The Observer, asserted that South's premier position was "due entirely to their playing together and using their headunity has been their characteristic feature; their football has been of a consistent character, and they have given the most finished exhibition of the game." It must have been a pleasant season for Iney Mehrtens as well, the only one of South's original premiership team of 1877 still playing. The 1892 season saw a five team competition in which sixteen games were played. From the first game of the season at Kengsington Oval, in which South scored 21.18 and kept Menindie scoreless, the blue and whites showed they were going to be a force to be reckoned with. Ably led by J. Reedman, who was to captain the side for five if its six premierships in this decade and a century later to be chosen as captain of South Adelaide's 'Greatest Team Ever', they won fourteen and drew one of their matches. They knocked the eventual runners-up Port Adelaide out of consideration for the premiership in a match in early September in front of 8,000 people at Adelaide Oval; it was a particularly rough game, with many behind the play incidents including some 'fisticuff business; in a final quarter in which South held Port scoreless to win 8.12 to 3.10. Nonetheless, South's success was attributed to their discipline, their regular attendance at training and their willingness to listen to the skipper on the field which, the writer added, had been 'by no means a characteristic of them during the past few seasons. Amongst South Adelaide's team members that year was also a wealth of cricketing talent John Reedman captained South Australia in both football and cricket, and played for Australia in 1894. Ernie Jones, a strong follower and goalshooter and interstate footballer, also played in a five test series as a fast bowler on his death in 1943, Wisden declared him to be 'the best fast bowler ever produced by Australia.' And there was also young Clem Hill, who went on to play 49 Test matches and to captain both South Australia and Australia. In a midseason match, South (2.5) went down to Port Adelaide (4.5) that was the only game the blue and whites lost for the whole year. In fact South's compete dominance of the competition was considered to be the main reason attendance at all matches had dropped off so much in 1895. 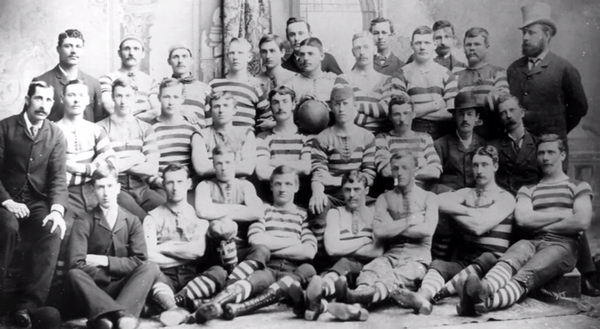 For that era, the team had been particularly cohesive over the first half of the decade, with 11 of the 1893 team, and 16 of the 1895 combination, still playing in 1895. However if there was one player 'who stood out conspicuously amongst his fellows' in the colony that year, it was halfback flanker for South, Alf 'Shaver" Marlow. The brother of the hard working secretary Frank Marlow who later became a great SANFL administrator, Alf played from 1890 to 1903 including the six premiership years, as well as representing the state in 1893, 1894 and 1901. He played a game ahead of his time, often running off the halfback line into attack, and was known for his cleverness, his speed, his dodging, and his cool judgement. Souths superiority saw them go through the season undefeated, winning 16 of the 18 matches played, and drawing the other two; to help balance outcomes, the North Adelaide and Native teams were permitted during this season to field three extra men when playing against South and the second side, Norwood. There was also talk this year about the possible introduction of a district system to try to even out the competition. The general consensus was that the best player in the colony was clearly Sid Reedman, the brother of South's captain, Jack. After finishing one game behind Port Adelaide in 1897, the South camp was rocked before the end of the season by the death by typhoid of one of their young and upcoming stars, Julius Niehuus. However, secretary Frank Marlow had been busy looking for recruits, and one of the new men was a fit and clever Bob Grierson, from North Melbourne, who made an immediate impression on the competition and was regarded at the end of the season as the best in the colony. This was also the second year in which full forward Jack Kay topped the competitions goalkicking list. At the end of season proper, a 'premiership' match was arranged between South and Port (who had finished in second position). South won 8.8 to 4.8. 1899 saw a reduction in player numbers from twenty to eighteen, and was the long awaited year when the district system was introduced, with the aim of evening up the competition. South immediately lost the services of top goalshooter Jack Kay, long serving captain Jack Reedman and Ernie Jones (who both went on to captain North Adelaide), with Reedman also lifting West Adelaide from bottom to top in 1908, as well as Percy Kekwick, Ted McKenzie and G.C. 'Squasher' Barnes, who later captained Sturt, West Torrens and Norwood respectively. With a new found emphasis on attacking football, and with Bos Daly kicking the association best of 32 goals for the season, South finished on top of Norwood, and then contested a 'play-off' match against them. South were nine points up at halftime, with O'Dea dominating the ruck contests, and rover Bobby Grierson ('the best man of the year') taking full advantage of the hit outs. In the second half Norwood had even greater difficulty in holding off 'the clever combination of South, who were playing perfectly together,' and the 'Freshwaters' (as South were frequently called) went on to record a 28 point win. After finishing on the bottom of the table in 1934, South appointed Port Adelaide's Vic Johnson to the coaching position in 1935 and, ironically, came up against Port in the Grand Final. After finishing second in the minor round and with Port winning the first semi-final convincingly, there were not many commenters who expected a South victory in the rematch in the Grand Final in memory. South began strongly to lead 5.1 to 2.3 at the first break. In the second quarter, the lead changed a number of times in a fast and fiercely fought quarter with South having an 11 point margin at half time. Finishing runners-up the previous year, South finished top of the 1938 minor round, losing only two matches, and then beating second placed Norwood in the semi-finals. In the Grand Final they faced off once more against Port in front of 33,000 spectators, who were thrilled by the fast, open football and long kicking of the first half, which saw the scores tied at 9.5 a piece at half time. Laurie Cahill's speed, determination and precision on the wing made him unbeatable and best on ground, and the club's Mid-North recruits in Jack Boyle, Jack and Jim Dawes, Jack Cockburn, Don Pryor, George Jobson and Laurie Rusby (with his 5 goals) had also figured prominently in the 23.14 to 15.16 win, in what is generally regarded as South's best team ever. 1964 was the twentieth season since the SANFL competition had recommenced after WWII; in eighteen of those years the newly named Panthers has finished bottom or second to bottom, only winning two of their matches in the previous year. The new season didn't promise much either, as there had only been two new additions to the training list tough little Alan White, and captain coach Neil Kerley. Early on, however, it was obvious that Kerley had added a new dimension of keenness and aggression, and in front of minor round crowds that touched 30,000, South finished with a 17-3 record, the same as Port Adelaide, the previous year's premiers whom they were to meet in the Grand Final. In front of 56,000 spectators, South held Port goalless in the first half, and prevailed over another final term Port fightback that saw them get to within 13 points before South kicked away to win 9.15 to 5.12.